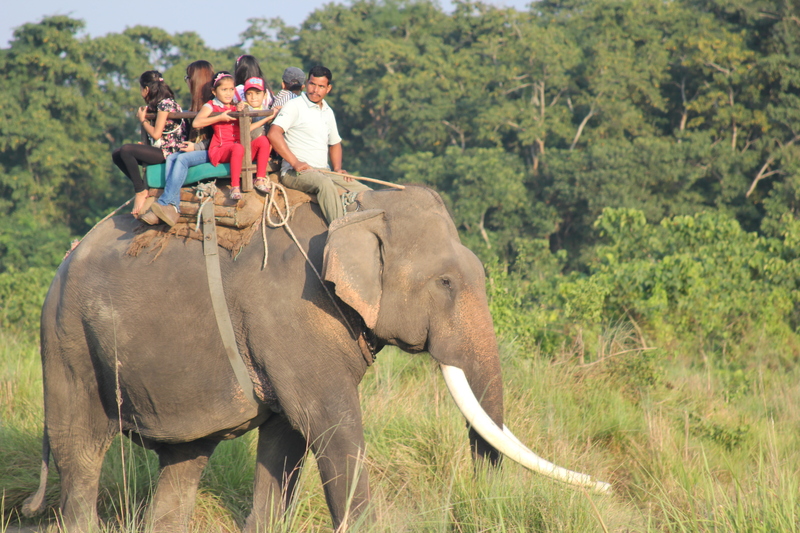 Elephant Watch Nepal conducts a campaign to inform tourists about the realities behind elephant safaris. Elephant safaris seem like an exotic adventure. Behind the rides however, there are painful conditions that tourists are often unaware of. Despite their great social skills, outstanding intelligence and environmental and religious relevance, captive elephants in South Nepal lack access to nutritious food, consideration of their social nature, chain free enclosures and humane management. How is a wild animal, a giant jumbo, controlled by human beings? Like in most countries, in Nepal it’s done through food deprivation, confinement and regular beating, as well as physical restraint such as chaining and shackling. Elephants are highly intelligent animals with complex emotions and social bonds. The above experiences can leave them traumatized, and highly unpredictable. Jumbos are overworked: Elephants conduct up to 7 trips, 7 days a week, carrying at least 4 people on their back. They often start their day before sunrise and come back after sunset. Jumbos are beaten: Virtually all elephants are beaten with a bamboo stick on a daily basis. Some mahouts use the cruel ankush or bull hook. 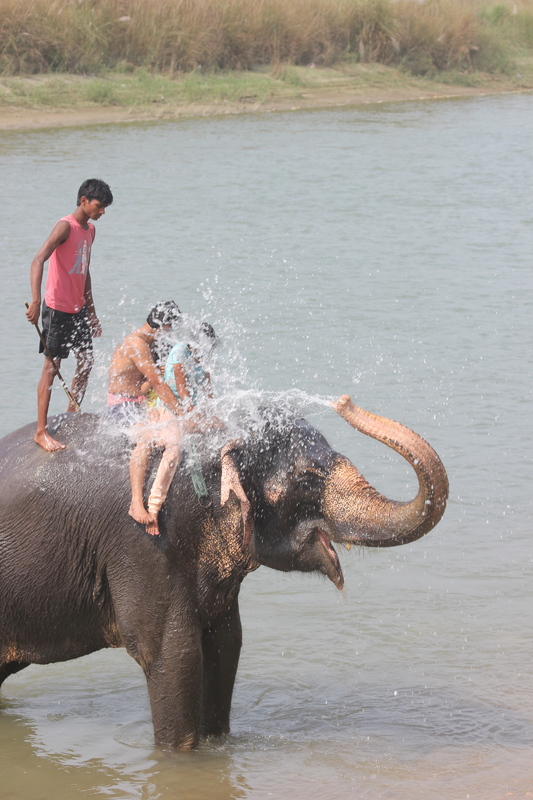 Jumbos are made to perform: “Bathing with tourists” is in fact a performance and is highly stressful. Elephants DO NOT enjoy it. 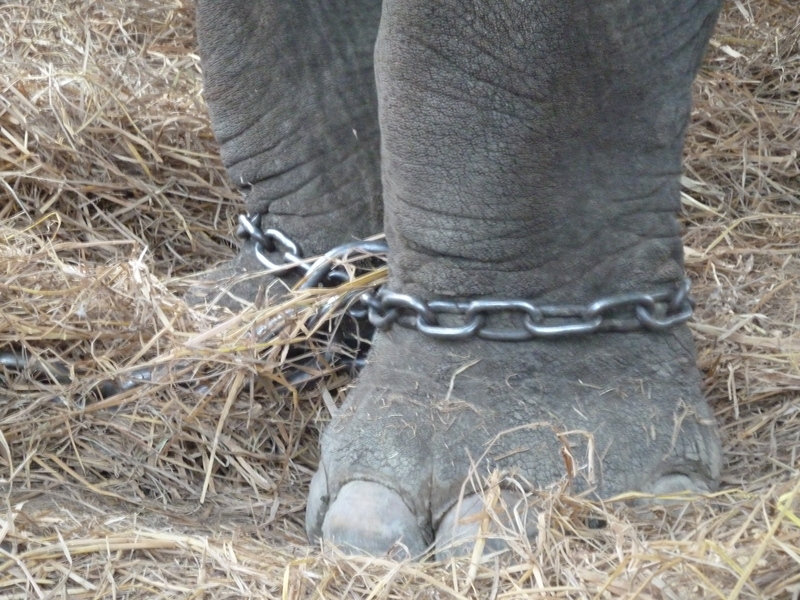 Jumbos are chained: After a long day’s work, elephants return to their shelter, and are tied with (spiked) chains. They can hardly move and often stand in their urine, causing feet problems. Jumbos’ training is cruel: The cruel “initiation ritual” consists of scarring, scaring and starving young elephants until they break. It is a practice that takes place still today. Jumbos do not retire: Nepal has no retirement facilities. This means elephants as old as 70 are still working. The life of a captive elephant in Nepal could not be further removed from a natural life in the jungle. Elephants are kept in simple shelters, basically a supported tin roof. They live alone or with a few others, shackled or chained. Elephants do not breed well in captivity and the mortality of young ones is high compared to that of wild elephants. The working life of an elephants is long one: 50 to 60 years. They have no access to retirement facilities. The wooden or metal ‘howdah’ used for transporting tourists are highly uncomfortable and inappropriate and cause saddle sores or even spinal damage. Elephants are made to work even when temperatures exceed 40° Celsius. Skin conditions and overheating are common. Foot care is substandard, leading to painful conditions which can be fatal if not properly cared for. Elephants hardly get a chance to show natural behavior and to socialize appropriately.